I honestly had given up on seeing another Charlie Fox novel — which was a cryin’ shame, but I get that authors have to move on sometimes. But then a couple of weeks ago, when I logged onto NetGalley to take care of something, there it was on the front page — and I jumped to request it (despite promising myself I was taking a NetGalley break to catch up on other things). Following his near-miraculous recovery from the injuries no one expected him to survive, Charlie Fox’s love/boss, Sean, hasn’t been the same. Now, it looks like he’s settling old debts — not necessarily his own. The fact that he’s doing that is bad enough — it’s not quite de rigueur for someone in his position to go around exacting vengeance. But the way these debts are being settled (if that’s what’s happening) speaks to someone not in full control. Charlie fights for the opportunity to do the boots-on-the-ground investigation to prove that it’s not Sean’s handiwork. This ground is Kuwait and Iraq, and before she knows it, Charlie is dealing with soldiers/mercs that she’s annoyed in the past, Russians with a grudge, Iraqis trying to defend cultural artifacts and certain three-letter agencies mucking around in it all — and every sign is that Sean’s up to exactly what Charlie is convinced he’s not doing. Before the book ends, she’ll come face to face with multiple faces from her past (none of which she ever wanted to encounter again) and will be forced to reassess some of the most formative events of her past and career. For those new to Charlie Fox — this would make a pretty good entry point, by the way — she’s former British Army, who received some special forces training, before her career was derailed. Since then she’s done plenty of work as a bodyguard and worked other types of security. She’s stubborn, loyal, inventive and tenacious. And deadly — it eats away at her, but when push comes to shove, Charlie’s as lethal as you can find. Killing because your life—or that of another—is in immediate danger is one thing. I’d been trained to accept that possibility right from the start of my army career. But appointing yourself judge, jury, and executioner is quite another. As is doing it anyway, only to discover that it doesn’t trouble your conscience nearly as much as it should. Sharp has given Charlie a strong voice — one you can believe can accomplish all she needs to, yet one that’s entirely human. The new characters are well developed — and we see plenty of old faces, too. One unexpected antagonist is almost too evil to be believable (but, sadly, I imagine that plenty of Armed Forces have people just like him). 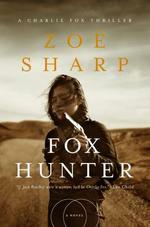 There’s one death that was a real gut-punch for the reader (or at least this one) — that’s a testimony to Sharp’s skill that she can create someone like that in a brief period. I don’t remember any of the previous novels being all that tied to current events, but Fox Hunter clearly took place post-Brexit and during the Trump administration. I’m not saying that’s bad, but oddly specific — and changes when the rest of the books happened as well, because this didn’t take place long after Die Easy despite the 5 years between the novels — I’d have had an easier time swallowing the book without that specificity, but not much — I note it because I found it strange. That aside, this is exactly what Charlie Fox readers have come to expect from her — she takes the proverbial licking and keeps on ticking, and kicking, swinging and everything else. Best of all, she thinks — she plots, she improvises, she keeps on trying. Not to sound cliché, but this damsel finds herself in plenty of distress — and gets herself out of it (occasionally with help — but not in a Nell Fenwick sort of way; more like Lt. Templeton Peck way). Plenty of action, plenty of violence, plenty of suspense — all with some character development, moving ongoing story arcs forward (while re-evaluating everything before). Not much else to ask for — except another volume soon. Disclaimer: I received this eARC from W. W. Norton & Company via NetGalley in exchange for this post — thanks to both for this.